A group of senior IT executives and former CIOs are attempting to direct the presidential candidates’ attention to the urgent needs of IT policy in the Federal government. They released a report on Feb. 11, titled “Tech Iconoclasts – Voting for America’s Success in a Network World,” an open letter to the candidates that outlines five key needs in Federal IT and recommends policy to address these needs. 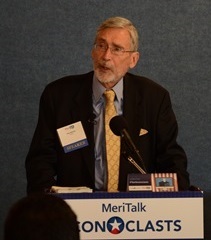 The release coincided with an event on the subject, held in Washington D.C. The Iconoclasts define the five central areas in need of address as Advancing America’s Competitiveness, Rebuilding Trust in Government and Institutions, Using Technology to Simplify and Enhance People’s Lives, Reinventing Government Technology, and Evolving the Workforce. Alan Balutis of Cisco Systems addresses the Iconoclasts event on Feb. 11 in Washington, D.C.
“This report is ambitious in its thinking, advocates aggressive timetables, and presents a challenge to a new administration to create a true 21st century government,” said Alan Balutis, senior director of U.S. public sector at Cisco Systems and former CIO at the Department of Commerce. Indeed, the report is ambitious in both goals and scope. It calls for a complete remodeling of Federal IT infrastructure across agencies, a reformation of educational and hiring practices for science, technology, engineering, and math (STEM) students, and a restructuring of both the patent and immigration system, among many other suggestions. The report justifies the aggressive plan with a grim outlook on the future if the administration does nothing. “Today’s thinking will not solve tomorrow’s challenges. The next president ignores the changing nature of the global network at his or her own peril. Indeed, the very ability of governments to govern rests on their understanding of the networked world and their willingness to change at network speed,” the report states. It goes on to note that U.S. investments may soon be outstripped by China’s, U.S. happiness and employment marketability still lags behind other countries, and overall trust in the government’s ability to protect data is at an all-time low. 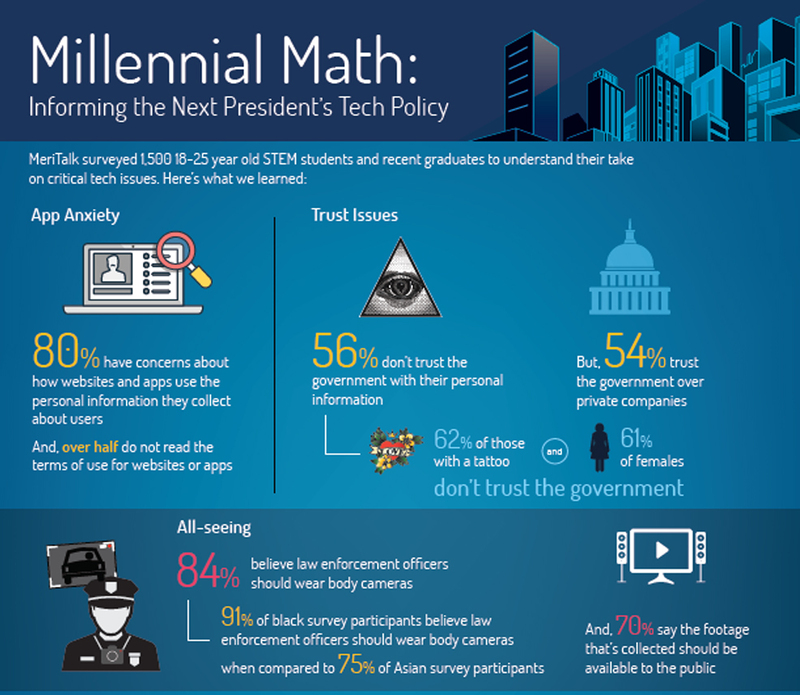 In conjunction with the report, the Iconoclasts released a “Millennial Math” infographic, which is based on a nationwide survey of 1,500 STEM students ages 18-25. The infographic details just how little faith millennials have in Federal IT capabilities. Seventy percent of those interviewed for the infographic said they have no interest in pursuing a career in government IT. And 66 percent said that there were not enough STEM role models for students. Beyond the purely technical spheres, the papers address issues in immigration, education, healthcare, and police brutality, arguing that these seemingly divergent areas all have a profound impact on IT, just as IT has a profound impact on them. Though each of the five areas lays out a specific plan for enacting change, they all stress that these changes are of vital importance to the nation’s future. This IT call-to-action sends a powerful statement to the presidential candidates: drastically change IT policy or be responsible for government failure on nearly all levels. Anil Karmel, CEO of C2 Labs Inc. and the former deputy chief technology officer at the National Nuclear Security Administration, agreed that now is the time for major change. “Usa.2020 is about changing from IT that was created to serve government to IT that is created to serve the people,” he said.